There’s an art to packing as many functional elements into a kitchen as possible, yet retaining visual appeal and simplicity. Creatively clean kitchen designs keep every necessary modern component at a cook’s fingertips without too much clutter, particularly when those components fit cleverly into a compact modular or all-in-one system. 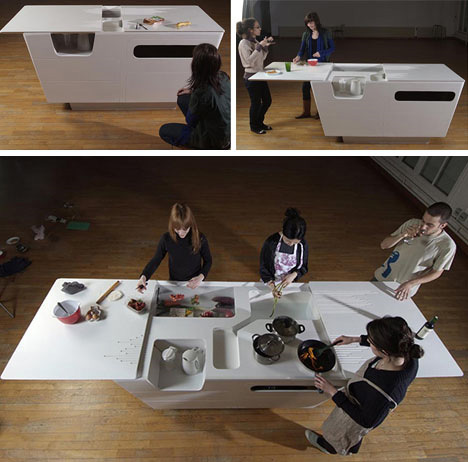 These contemporary kitchen concepts are sleek and minimalist, yet livable for everyday use. Not everyone needs a vast, open kitchen space populated with the latest and greatest in oversized commercial appliances. Particularly in small homes and apartments, compact all-in-one kitchen sets can contain everything the occasional cook needs for everyday meals: prep space, a cook surface, seating, and storage. A key to sustainable kitchens is using what you’ve already got: water from drying dishes can water plants, food waste can feed them, and cool running water can help keep a small refrigerator cold. 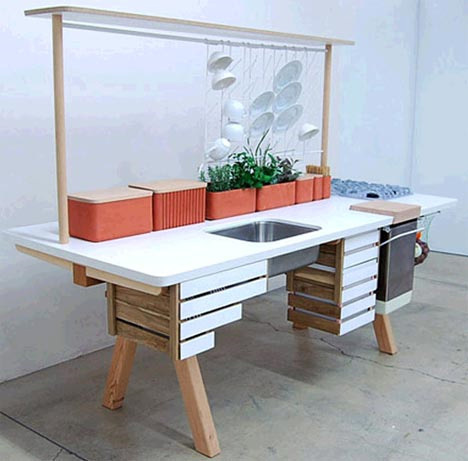 This ‘flow kitchen’ does all of the above in a compact, earthy design that is eco-friendly and practical. It’s the ‘disappearing room’: a clever fold-up luxury kitchen that contains all of the essential elements for cooking and dining, hidden behind matte wood and metal doors in the wall. 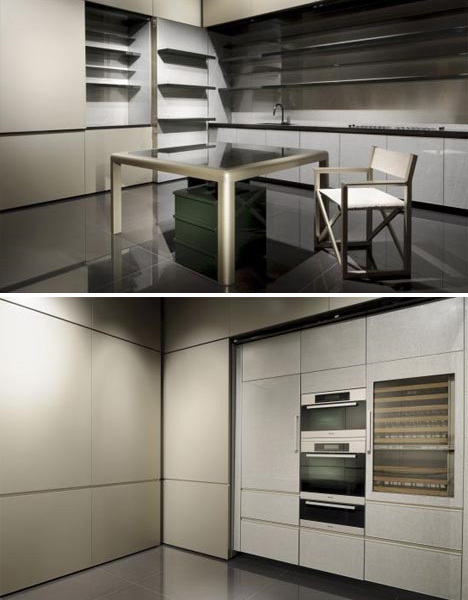 This design by Giorgio Armani manages to fit a standard dishwasher, refrigerator, gas stove, steam oven, standard oven, food warming drawer and even a miniature wine cellar into a room that looks entirely bare when packed up. 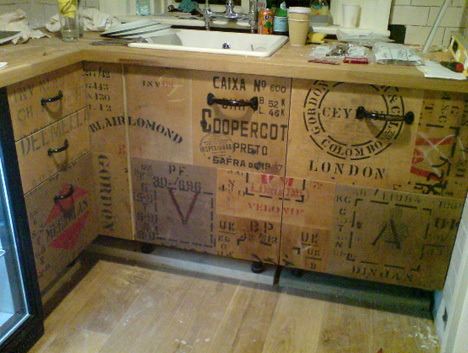 When it comes to eco-friendly kitchen design, nothing is held in higher esteem than upcycling used materials in an effective, attractive way. This kitchen remodel features creative, artistic-looking cabinets made from vintage tea crates – a hint of the rustic, but in a streamlined, modern package. 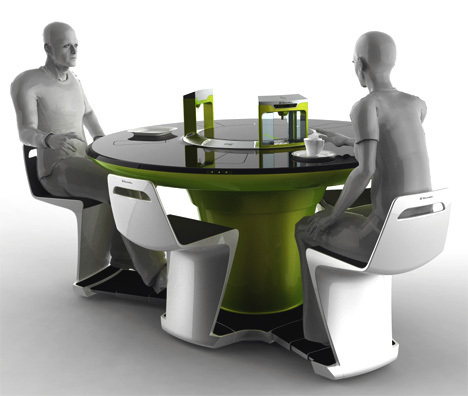 What appears at first to be a simple, if futuristic-looking, pedestal table and dining chair set actually contains a cleverly disguised collection of gadgets that provide practically any function you could imagine wanting at your dining table. The top digitally displays dining options and serves as a computer monitor as well, so diners can browse the internet while waiting for their meals. 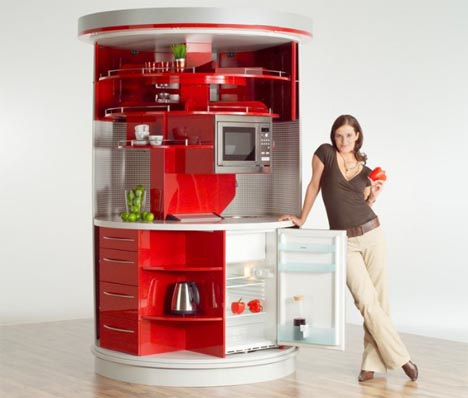 The inside also stores food, household appliances and even compartments that clean dishes when you’re done eating. 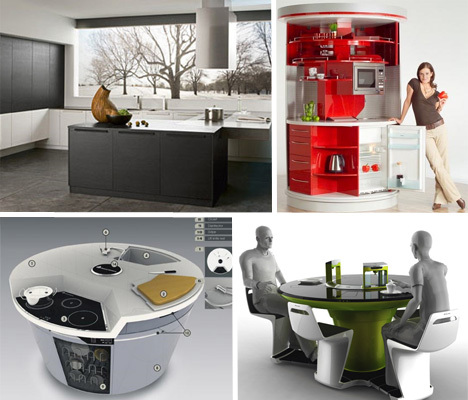 A somewhat more attainable option for the near future is this compact all-in-one kitchen station, a columnar design that rotates to reveal various functions and contents. It takes up a minimal amount of wall space, and manages to pack in a refrigerator, sink, microwave, dishwasher, surfaces, cupboards and cabinets into six square feet. How clean and simple can a kitchen be? 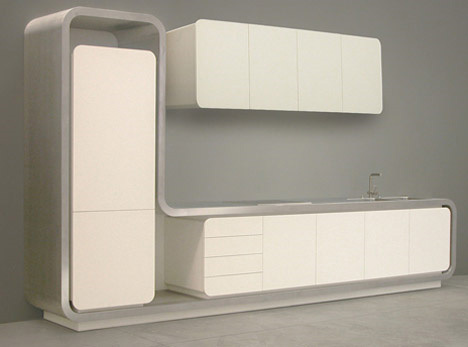 This ultramodern kitchen set by Strato has a futuristic look with its flat, matte white surfaces, but gets a little warmth and character from its curved edges. Modern minimalist design is the perfect complement to eco-conscious sensibilities, since it uses the least amount of materials to attain a stylish look with the maximum amount of functionality. This built-in kitchen counter-and-fixtures set by Valcucine has a sleek, clean-lined look and can be easily disassembled and recycled when its usefulness has come to an end. Why should all of a kitchen’s vital components be pushed up against the walls of the room? 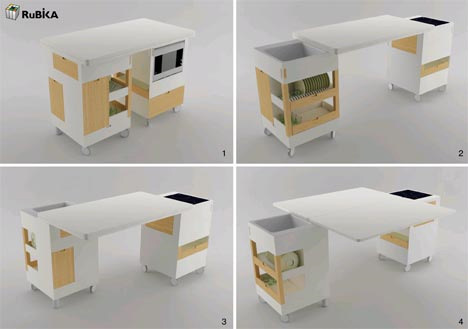 This compact modern kitchen design by 3 Chinese designers places the sink, stovetop, dishwasher, oven, and cupboards in a central island that takes up as little floor and wall space as possible. 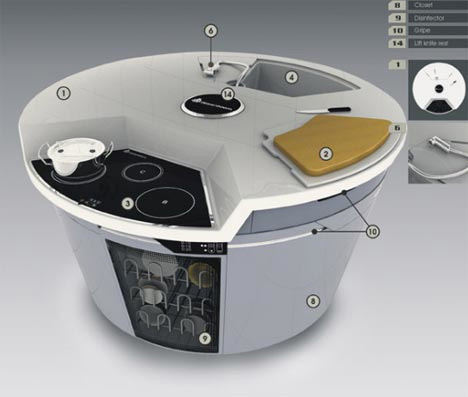 The entire island can be rotated and is topped off by a combination overhead light/vent hood. 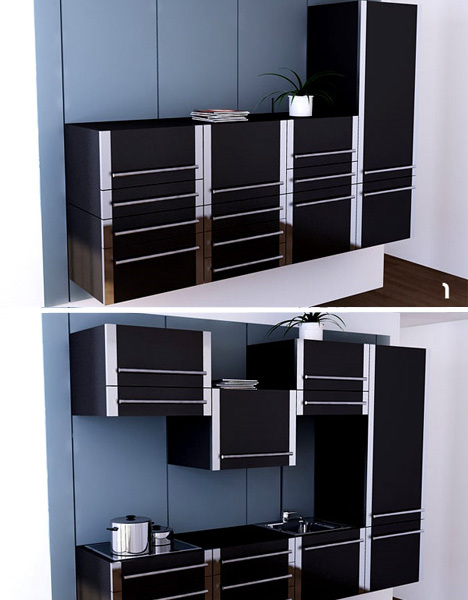 This isn’t just a chic, simple set of black and silver kitchen cabinets. It’s actually a dynamic system that can be adjusted to the user’s needs, with each individual unit sliding up and down on wall tracks to create a variety of configurations. Especially when entertaining, it can seem as if there’s never enough space in the kitchen. That’s where fold-out work surfaces really come in handy, as in this elegant white kitchen island. It starts out as a simple box, but once opened, it reveals plenty of cooking and cutting surfaces, storage space and sinks. 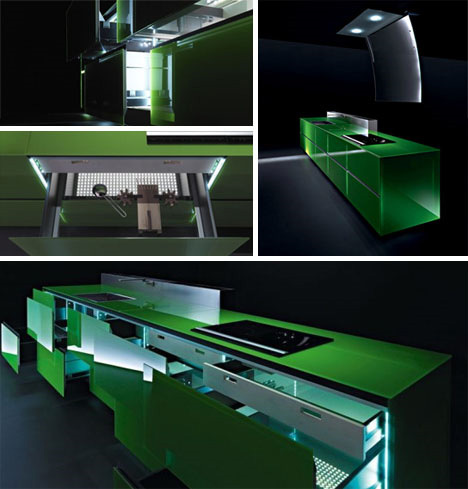 This kitchen design idea by KicheConcept isn’t just colorful and appealing, it’s livable as well. 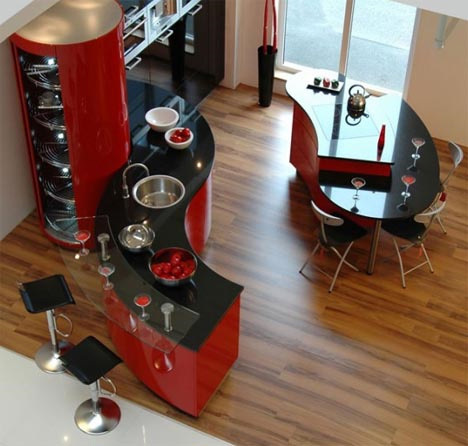 With shiny surfaces in black and candy-apple red and an interesting, fluid design that would fit well into a variety of kitchen shapes and sizes, it’s a perfect blend of style and substance. 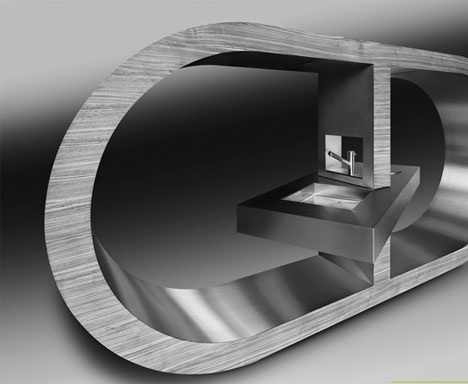 Just like impractical runway fashion is often more about art than clothing, some furniture design puts form over function in over-the-top designs meant to dazzle. But even if they won’t be appearing in real kitchens any time soon, Stratocucine’s high-end steel kitchen designs highlight the best of what minimalism can be: clean, simple and soothing. 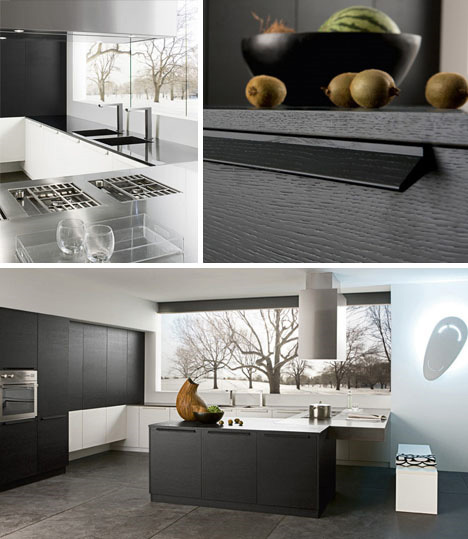 On the more user-friendly end of the spectrum is this stunning contemporary black-and-white kitchen design by Futura, which features strategic steel in conjunction with other materials. The geometric shapes and monochromatic color scheme is warmed up by wood and smart use of negative space.